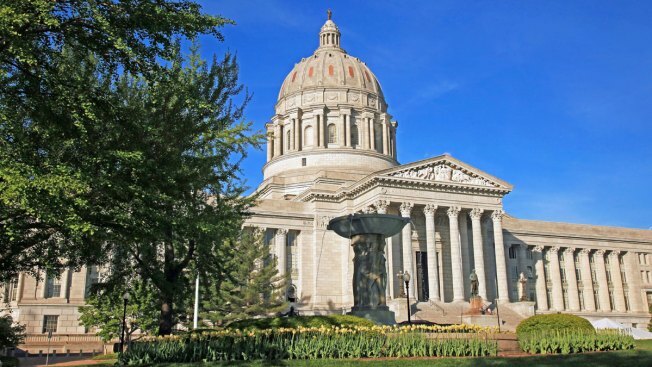 Missouri House candidate Steve West said his ex-wife "poisoned" his children during an "extremely toxic divorce"
This file photo shows the state capitol building in Jefferson City, Missouri. Two of Missouri Republican Steve West's three children told a local newspaper this week that voters shouldn't send their dad to the state legislature, saying he is racist, homophobic and anti-Semitic, NBC News reported. "He must be stopped," Andy West told the Kansas City Star. "His ideology is pure hatred." The newspaper had previously compiled a long list of offensive comments Steve West made on his radio show, YouTube channel and website. But West, who's running for the Missouri House's 15th District, told NBC News that he is not biased against Jews, racist or homophobic, and said his ex-wife "poisoned" his children during an "extremely toxic divorce."